Conventional wisdom says the rise of large, relatively low cost digital displays, and simple, scalable software to manage them, marks the beginning of the end for much of the mainstream printing business. Well, maybe one day…far into the future. For now, the digital signage and large format printing businesses are doing very different things, Rather than looking at each other as enemies, smart companies are teaming up to generate high impact, hybrid visual solutions. Big print provides visuals at a scale and vibrancy consumers can’t help but notice, at a workable budget. 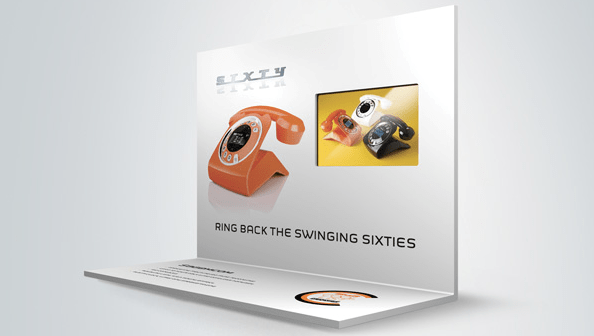 Digital displays nested into that print add immediacy, interactivity and all-important motion. Think about shopping malls, which almost always have some vacant retail space – the windows papered over or wood hoardings covering the façade. That’s a canvas for brands. It’s a billboard at eye-level, seen daily by 1,000s of consumers with shopping on their minds. We’re starting to see brands as diverse as eBay and fashion’s Rebecca Minkoff do in-mall displays that take over empty store windows, using big printed vinyl graphics to draw the eye and screens or rear-projection surfaces built into the graphic design to power interactivity or motion messaging. Some of these combination print and digital displays are even shop-able. The same thing has been done in the central business districts of big cities, taking over vacant storefronts or even walkways in subway stations to create visual displays that can’t possibly be missed. Where large, fixed digital displays – both indoor and outside – tend to be high, out of reach and arguably out of sight, these hybrid displays are at eye-level for everyone. But these hybrids are not just about vast print and digital canvases. They can be much smaller, and even portable. Think again about places like shopping malls, airports and train stations. These days, there’s often one or many large digital posters standing like totems in the entry areas and along the major walkways. Almost all of them are black, white or brushed stainless steel. Those digital display enclosures often have a lot of surface area that are their own canvases. Adhesive vinyl print, or even printed magnetic materials, can change these housings from generic to highly visual – supporting the venue, coming events or featured advertisers. Big retail and public spaces are increasingly focused on experience – changing consumer perceptions from being places people go to out of necessity, to places they want to be. That’s not always easily done, but one of the key ingredients in that experience recipe is making the visuals interesting and pleasing, and keeping them fresh. Sprinkling digital signage displays around a venue is just a piece in that puzzle, unless the budget has no real constraints. 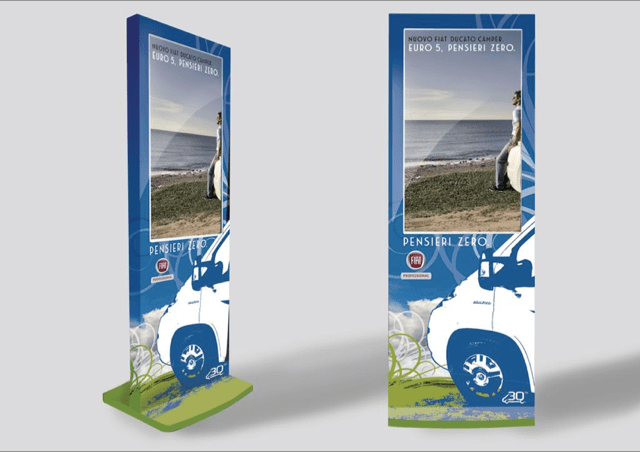 Big print like lightboxes and other solutions will fill out the space on more realistic, sustainable budgets. The other reason why digital and print are complementary is design aesthetics. The best visual solutions projects in retail and public spaces look like they’ve always been there, or fully fill a large space. The worst look like TVs hung where there was some spare wall space, cords and cables running down from the ceiling. Hybrid displays get to the size and scale that make them fit in their environment, but have the digital set-up and installation framework that allows both the digital and print components to be refreshed based on plans. 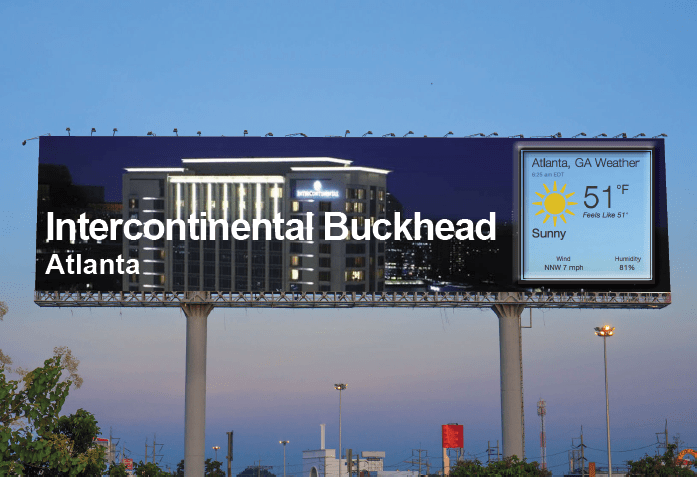 For brand marketers, hybrid signs strengthen advertising and promotional campaigns by creating a greater visual impact – both in size and potentially in shape. They’re also made stronger by being dynamic. A print-only campaign needs to be planned and executed days or even weeks out. By adding digital, critical messages and changes can be swapped out in a matter of minutes, from anywhere. There are even dynamic advertising campaigns tied to live data, like flight departures from airports or sunrise and sunset cycles. Combining both technologies gives marketers a bigger, better toolset and consumers a more complete and satisfying campaign message. The print industry has started to see digital signage supplant traditional printing for things such as menu displays in fast food restaurants. But that started to change only when display panels built by the millions dropped to a low price threshold that started to make fiscal sense for restaurant operators. We’re not there, or really even close in price, quality or flexibility, for digital displays to supplant large format graphic printing work. There’s a reason the giant LCD and LED video walls that pop up in splashy flagship stores don’t also make it to the stores in the suburbs. Costs. Lots of costs. Six and seven figure costs. That will change. The price curve is steadily downward and the quality curve constantly climbing. But for now, and for some time, the smart move for both the large format printing business and digital signage solutions providers, is to work together on hybrid solutions that deliver the best of both. Mohamed Ghalayini is the general manager of media mea llc, a digital media marketing development firm specializing in the fabrication of LCD/LED Digital Signage displays. media mea is based out of Columbia, SC, USA; with branch offices in Atlanta, GA, USA, Manchester, United Kingdom, Beirut, Lebanon and Kowloon, Hong Kong. A logistics office in Dubai, U.A.E. belonging to media mea overlooks all operations of shipping and parts by supporting the large distribution network throughout the Americas, Europe, Asia, the Middle East and Africa. media mea’s distributors are spread all over the world giving the end user a total satisfaction and quality services, while assisting businesses achieve creativity in targeting the right audience with both indoor and outdoor communication displays. media mea’s clients enjoy 24/7 customer support that ensures great ongoing services.